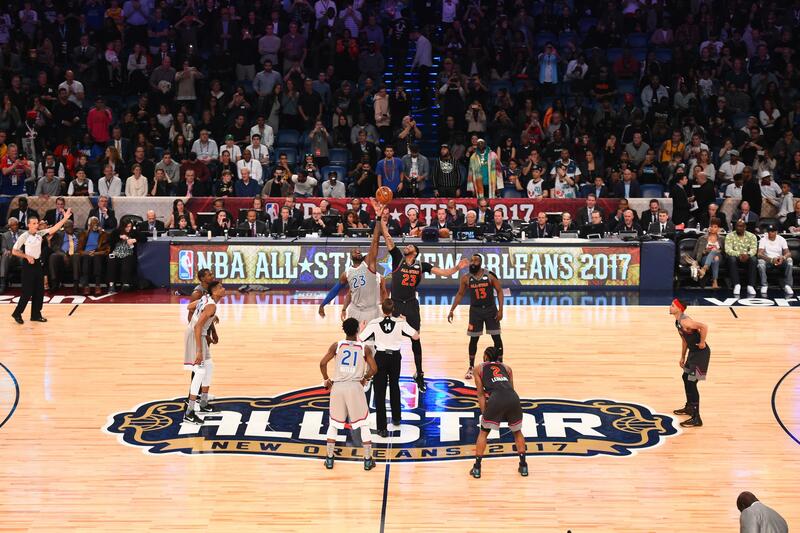 The brightest stars of the NBA gathered in New Orleans for the most exciting event of the NBA season this weekend, NBA All Star Weekend. From Friday to Sunday night, a number of challenges and games were on display at the Smoothie King Center. On Friday night the 17th, the weekend kicked off with the BBVA Compass Rising Stars Challenge. This is a friendly exhibition game compiled of the NBA’s most talented first and second year players. The teams are divided by players born in the U.S, and players born in other countries around the world. The World squad outlasted the USA squad in a high scoring affair, 150-141. Denver Nuggets rookie and former seventh overall pick in last year’s NBA draft Jamal Murray took home MVP honors in the game. Murray tallied 36 points, including nine three pointers. The most jam-packed action followed on Saturday night, as three major events took place. The first was the Taco Bell Rising Stars Challenge. In this ultimate test of basketball skill, four big men and four guards completed a timed competition that involved ball handling, passing, speed, and shooting, in that order. The participants for the big men were second year player of the New York Knicks center Kristaps Porzingis; four time all star power forward Anthony Davis of the New Orleans Pelicans; center Nikola Jokic of the Denver Nuggets; and three time all star center DeMarcus Cousins, formally with the Sacramento Kings, and now a New Orleans Pelican as of last Sunday night. On the flip side, the guards in the competition were the NBA’s second leading scorer Isaiah Thomas of the Boston Celtics, talented one time all star Gordon Hayward of the Utah Jazz, all star point guard John Wall of the Washington Wizards, and second year Phoenix Sun Devin Booker. Porzingis rose above the rest out of the big men, displaying his plethora of skills that make him look like a guard despite standing at 7’3”. For the guards, Hayward set up an intriguing final, consisting of two of the NBA’s most promising young players. In a tight final, Porzingis represented the big men as he defeated Hayward to take home this year’s Taco Bell Skills Challenge title. Following the skills challenge, some of the game’s top snipers competed in the JBL three-point contest. Of eight total participants, three advanced to the final to compete for the three-point contest title. The five players who came up short of the final were Toronto Raptors three-time all star guard Kyle Lowry, who scored just nine; Portland Trailblazers guard CJ McCollum, who scored 10; Dallas Mavericks guard Wesley Matthews, who scored 11; Los Angeles Lakers guard Nick Young and last year’s three-point champion Klay Thompson of the Golden State Warriors, who each came up just one point shy of advancing with 18 points. As for the finalist, Cavaliers guard and four time all star Kyrie Irving, Charlotte Hornets guard and one time all star Kemba Walker, and Houston Rockets guard Eric Gordon, who ranks 4th in total 3 point field goals in the NBA. Former New Orleans Pelican Gordon proved he had an advantage in being familiar with the gym, as he beat Irving and Walker to win the JBL three-point contest. The final Saturday night event, usually the most exciting of them all in the Verizon Slam Dunk Contest, was rather dull this year. The event had plenty of hype building up to it because Orlando Magic forward Aaron Gordon decided to return and participate two years in a row. In last year’s dunk contest, he pulled off many dunks that left the Toronto crowd in awe. This time around, Gordon appeared to be pressing and ultimately failed to give the fans a good encore. He missed his first three straight dunk attempts as he used an Intel Drone to drop the ball to assist in his dunk. The stunt backfired as Gordon failed to advance to the final, disappointing the NBA fans who were expecting an outstanding encore from him..
With Gordon eliminated, the final consisted of small forwards Derrick Jones Jr. of the Phoenix Suns and Glenn Robinson III of the Indiana Pacers. Many fans weren’t familiar with these two young players prior to Saturday night. With an impressive double pump dunk while also leaping over two people, Robinson III beat out Jones Jr to claim the victory in the Verizon Slam Dunk Contest. Discussion of changes to the contest’s format has taken place in the aftermath of the underwhelming dunk contest. The weekend of events culminated Sunday night with the 66th NBA All Star Game. The top 12 players from the western and eastern conference competed in the game. In the juiciest and most drama filled subplot of Sunday night’s game, former Oklahoma City Thunder teammates small forward Kevin Durant and point guard Russell Westbrook played as teammates for the first time since last season. The two haven’t spoken to one another since Durant signed with the Golden State Warriors this past offseason. Durant chose not to call Westbrook to tell him he was leaving Oklahoma City. A week prior to Sunday night’s game, Durant returned to his old stomping grounds in OKC as a Warrior. In the second half of the game, the two exchanged some heated words trash talking one another. Coming into Sunday night, everyone was on the edge of their seats to see how these two former teammates would interact with one another at the height of their controversy. In the middle of the first quarter, just like old times, Durant threw an alley oop to Westbrook who dunked it home. A timeout ensued following the connection between the two, and the western conference bench humorously celebrated the play as Durant and Westbrook smiled, enjoying a brief moment as teammates again. Sunday night’s game was also highlighted by multiple broken records. The teams’ combined 374 points was the most in all star game history. This is a trending broken record as it’s the fourth straight year that the all star game point total has been broken. In the first quarter, the teams combined for 101 points, the most points in any quarter in all star game history. And New Orleans Pelicans forward/center and four time all star Anthony Davis’ game high 52 points broke Wilt Chamberlain’s 1962 all star game point record of 42. Davis’ record breaking performance earned him All Star Game MVP. This was certainly a fitting and special honor for Davis, doing it in his hometown of New Orleans.